From education, health and business to public policy and infrastructure, an agenda for building the positives, and not merely reducing the negatives, has now been set across the MENA region. We are confident that researchers, policymakers and practitioners will get on board along with organizations, educational institutions, ministries, non-profits, and other stakeholders to ask big, bold questions that add, challenge and enrich what we love and know to be true about the region. Yet, questions, challenges and many unknowns remain; thus, we end this book with the practical in mind and set forth some future directions and closing thoughts. DeSilver, D., & Masci, D. (2017). World’s Muslim population more widespread than you might think. Pew Research Center. Retrieved from http://www.pewresearch.org/fact-tank/2017/01/31/worlds-muslim-population-more-widespread-than-you-might-think/. Helliwell, J. F., Huang, H., Grover, S., & Wang, S. (2018). Empirical linkages between good governance and national well-being. Journal of Comparative Economics, https://doi.org/10.1016/j.jce.2018.01.004. Ivry, A. (2008). Arabic and Islamic psychology and philosophy of mind. Stanford Encyclopedia of Philosophy. Retrieved from https://plato.stanford.edu/entries/arabic-islamic-mind/. Lambert, L. (2017). Developing character strengths at university (For a GCC audience). The facilitator’s manual. Amazon Publishing. Retrieved from http://a.co/2sxBX3M. Lambert, L., Passmore, H.-A., & Joshanloo, M. (2018). 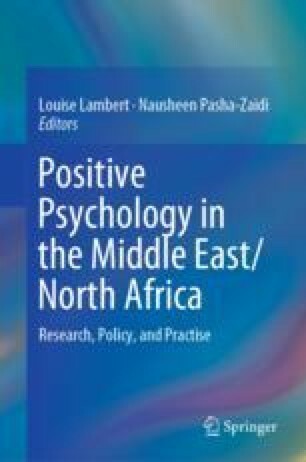 A positive psychology intervention program in a culturally-diverse university: Boosting happiness and reducing fear. Journal of Happiness Studies, https://doi.org/10.1007/s10902-018-9993-z. Lambert, L., Passmore, H.-A., Scull, N., Al Sabah, I., & Hussain, R. (2018). Wellbeing matters in Kuwait: The Alnowair’s Bareec education initiative. Social Indicators Research, https://doi.org/10.1007/s11205-018-1987-z. Pasha-Zaidi, N., Afari, E., Sevi, B., Urganci, B., & Durham, J. (2018). Responsibility of learning: A cross-cultural examination of the relationship of grit, motivational belief and self-regulation among college students in the US, UAE and Turkey. Learning Environments Research, 1–18. https://doi.org/10.1007/s10984-018-9268-y.